Moscow, January 16, 2017 — Business Systems Consult. International Financial Reporting Standard #9 puzzled banking methodologists. According to it, banks have to recognise expected losses for loans. Financial reporting grows from risk disclosures to risk accounting. But the methods for it are different than methods used in risk management. What are the peculiarities of risk measurement under IFRS 9? How to make it cheap and functional? How to improve risk management in the bank to make not only financial reporting clearer but also to increase stability and quality of incomes? Why IFRS 9 Is Different Than Basel? Risk management is considered as a business function which is far away from accounting. Risk managers and accounting methodologists rarely work in joint teams. Therefore, traditional split between accounting and risk management is the first reason for this huge difference between Basel and IFRS 9. Accounting and Risk management have different aims. The principal aim of accounting is to show fair value for financial instruments, expected financial result, substitution value, etc. The aim of Risk management is to step beyond the framework of expectations, to look at how the result may differ from the average or expected value. IFRS 9 ends with expected losses while risk management only departures from them. IFRS 9 ends with expected losses while risk management only departures from them. Accounting focuses on short-run market situation — how much a financial instrument costs here and now. One should not be confused: short-run market situation may include long-term horizon of expectations. It is what defines current profit or loss. If market situation changes, the changed value of financial instruments will be recognised. Risk management considers potential changes in market situation, sometimes even in large time horizon. It estimates how profit may change (specifically, may fall). Possible (but not probable) losses are covered by economic capital. The second reason for differences is different focus: either economic capital covering future market changes (in Basel) or present financial result of short-run market situation. Accounting is based on the facts. Risk management is based on the fears that facts are not constant in time. The third reason for differences is focusing on fabled scenarios in Risk management (ie, in Basel) or facts without uncertainty in future in accounting (IFRS 9). Basel or IFRS 9: What Is the Difference? Analysts of accounting firms summarised the principal differences between IFRS 9 and Risk Management approaches (see the table). that is the difference between net present value of contractual and expected cash flows. Sometimes similar tables also cover comparison of approaches to loss given default (LGD) determination and discounting rates. However, in reality Basel formula is not a difference between net present value of contractual and expected cash flows. Parameters like PD, LGD etc in IFRS 9 models are vestiges of Basel. Such models carry significant risk for banks because Basel models in their essence are not IFRS 9 compliant. One of the key differences which is usually beyond the analysts’ scope is that accounting is always on the basis of separate financial instruments while Basel models are always portfolio models. How to calculate loss allowance in accordance with IFRS 9 for a diversified loan portfolio? Certainly, collective approaches should be applied, and IFRS 9 allows to do it. In this case, the most predictive information for defaults and past due amounts is default information and past due amounts. Actual data contain information on past due volumes in future but to deal with it, analysts have to build frequencies of state transitions. These frequencies are called roll rates (figure 1). They usually are averaged in loan vintages but the recent loans in past due should obtain more weight. The problem is that as any statistical measures they are the functions of samples and therefore they are through-the-cycle risk estimators. However, there exist some mathematical techniques (for example, realised in Roll Rate Analytic System) allowing to build influence factors of macroeconomics, borrower quality, etc. (figure 2). These techniques are meant to build point-in-time transition probabilities. Obtaining transition probabilities is almost unsolvable problem without these techniques basing solely on straightforward statistical methods. These techniques were firstly introduced by Vladimir Babikov. Their special cases were investigated in works of Joe Breeden. Loan portfolio as of reporting date should be separated on the subgroups basing on the term in past due. For any such group one can forecast past due volumes at any given moment in future. In fact, such modeling determines expected cash flows for these groups. Basing on them, net present value of cash flows can be calculated for time horizon of either 12 months or for the whole residual lifetime of the loans. Expected cash flows under this approach are computed directly without any modeling, simplifying assumptions, or artificial characteristics like PD, LGD. Moreover, this approach makes possible strict definitions for these characteristics and provides means for their precise calculations. Determining significant increases in credit risk may be based on marginal LTS analysis. 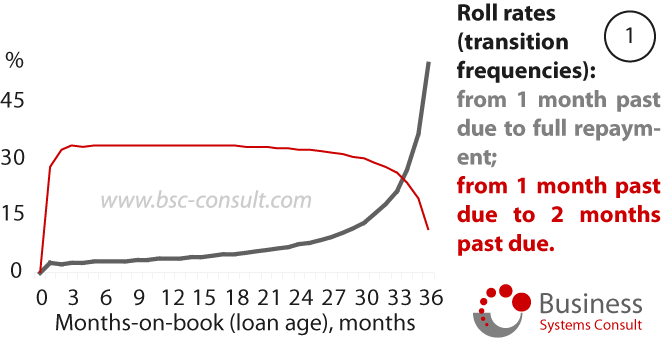 Marginal LTS is a ratio of loss-to-sale figure and initial loan term. It represents credit risk of the borrowers in the most laconic form (figure 3). The concept of marginal LTS was initially introduced by Vladimir Babikov in his seminal article “Theory and Practice of Retail Lending” (in Russian). Modeling credit risks basing on roll rates helps not only satisfy IFRS 9 requirements. In fact, IFRS 9 compliance is a by-product of effective portfolio management. IFRS 9 compliance is critically important but effective portfolio management based on predictive analytics, smart data, deep learning approaches carries more profit and increases return on capital. To increase efficiency, it is important to precisely forecast credit risk level and to compare it to planned return on assets. Comprehensive approach to IFRS 9 implementation facilitates to achieve all these aims. Russian version of this article. 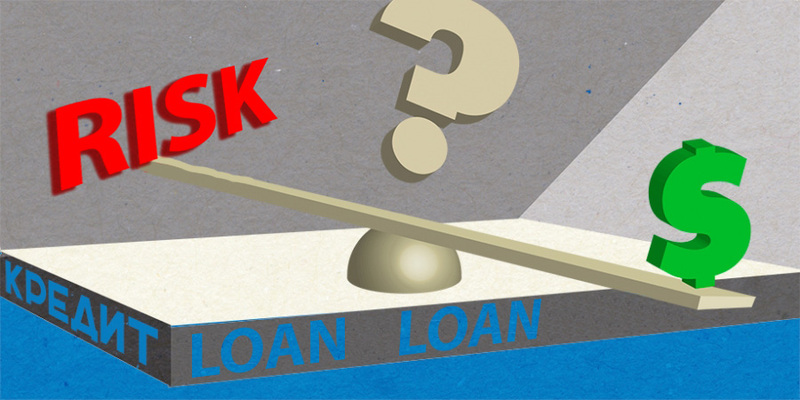 Floating Rate Loans: Do Banks and Their Customers Really Need Them? Retail Lending and Risk Appetite Statement: manage risks but not measure them, add value but not impose additional costs. Interesting article! Curious to know if you have worked on Expected Credit Loss Modelling? Actually, we are working on Expected Loss Modelling now. In particular, we have developed a methodology (with concrete formulae) for IFRS 9 calculations and applied it to some portfolios of our clients. This is a hot topic, and our solution is one of the best in the market. It covers not only allowance calculations but also modelling process, model validation and allowance budgeting. thanks a lot for this clear explanation, this is a good oportunity to join two of the most relevant areas in the company.